Please go to CarrotStick.ca for the most current information about Vancouver's children's illustration & interior design services from Christine Wong, illustrator-designer. The graphic above is a 2005.10.12 screen capture of the CarrotStick.ca home page as recorded for the Provenance.ca ISSN 1203 8954 web magazine for librarians and archivists 1995-2005 by www.netpac.com as part of our "Internet Archive Collection"
Other graphics on this section represent the earlier sample illustrations and children's' cartoons on the original prototype website done in 2003. 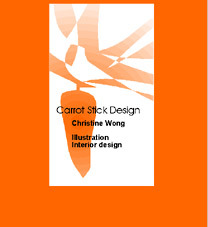 Please go to www.carrotstick.ca for the most current and up-to-date information about the activities of Christine Wong, acclaimed children's illustrator and interior design service provider.